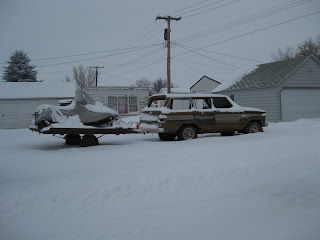 In what could be the perfect yard full of perfect projects lies this completely stripped mid-70's Wagoneer towing two snowmobiles. What makes the vehicle so incredible is that all of the glass has been removed, save the front windshield - which as we all know provides maximum comfort and visibility for those long mid-winter ice fishing trips. With four of the most aggressive-yet-small mud tires (maybe even ATV or Ag tires), this old SUV is built to plow through snowbanks and mudholes all the same. Enough about the truck. This could be my dream home. 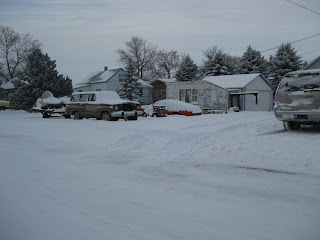 With projects like a '71 Torino, sand rail, Wheel Horse, Chevy Monza, homemade gooseneck, an olive green '73 Ford F-350 crew cab, and a bitchin' shed to get you through the winter, who would want to go South?